The Total Phase Beagle USB 480 Power Protocol Analyzer is a powerful tool that not only offers high-speed, non-intrusive bus monitoring but provides VBUS current and voltage measurement within our industry-leading Data Center Software. Engineers can easily monitor power levels on VBUS in real time, which allows them to trouble-shoot irregular allocation of power for a more efficient use of USB protocol. This tool also offers enhanced USB 2.0 advanced triggering and an extra-large hardware buffer of 256 MB. The 256 MB hardware buffer enables engineers to capture larger pre-trigger volumes of data, further enabling an engineer’s ability to perform complex debugging. 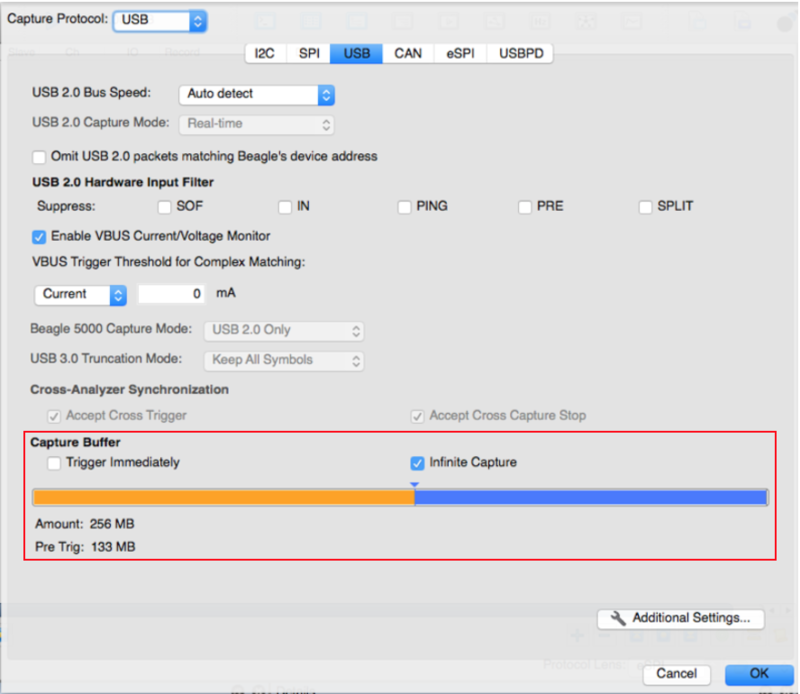 Most users are looking for a set of conditions to trigger a capture start. However, users are occasionally looking for a trigger to stop a capture. For those using the Beagle USB 480 Power Protocol Analyzer - Standard Edition with the USB 2.0 Advanced Triggers Upgrade, or those using the Ultimate Edition, here is the best way to stop a capture on a trigger using the advanced triggering feature. 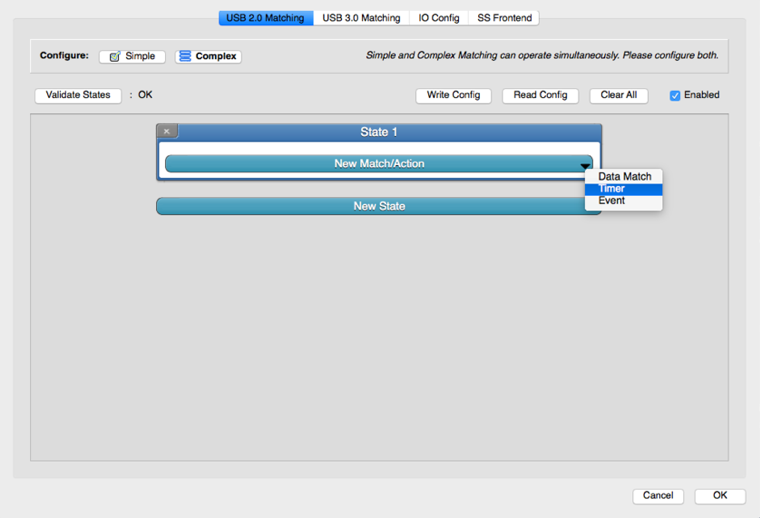 The Advanced Match/Action system provides developers with the ability to create complex, multi-state matches for USB 2.0. When a match occurs, the match unit can have one or more defined actions such as trigger the capture, assert external output, filter out the matching data, or go to another state. 2) Configure the Pre-Trigger Buffer size to 99% to capture maximum possible data before trigger condition. 4) Under Additional Settings, choose the Complex trigger configuration. 5) Under the State Match/Action, set-up the trigger condition using the matching options. There are match options for data patterns, timers, and bus events. Once trigger happens, data will begin downloading from the Beagle USB 480 Power analyzer’s on-board hardware memory to the PC. The data capture will be limited to 256 MB because “Infinite Capture” was not selected and the capture will stop automatically when the trigger condition occurs because the Pre-Trigger Buffer was set to 99%. Note: This set up also works with any of our Beagle USB 5000 v2 Protocol Analyzers, which have preconfigured access to USB 2.0 advanced trigger capabilities. For units with USB 3.0 advanced trigger capabilities, the process above will also work but the maximum capture size will be 2 or 4 GB based on the Beagle USB 5000 v2 analyzer hardware version. For more information on how to set up advanced triggers, watch here.